Yesterday one of our new teachers was teaching wrestling with some younger students and having them explore ways to tip over someone who was on all fours. After they experimented for a while he asked the kids what worked? The first boy said “I pulled one of his arms and pushed him over.” The teacher thought that was good and then asked a second boy who responded “I tickled him”. 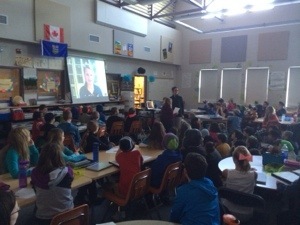 Today during a Skype session our Grade 6 students had with Diane Cockle, a lead crime investigator from Vancouver, a student asked her what the weirdest piece of evidence she has ever found and her answer was Cheese. She explained that a serial break and enter case was solved because at each house the robber would pull the cheese out from the fridge and take a bite. The fingerprints they got off the blocks of cheese were used to convict him. I have such a great job.